It’s time for Claire and Kyle to begin our next pairing: Jirel of Joiry by C.L. Moore and Outlander by Diana Gabaldon! This week we focus on the sword and sorcery heroine of pulp magazines, Jirel, one of fantasy’s first female protagonists written by a female author. In our history segment, Kyle walks us through some of the first female fantasy authors including 17th century aristocrat, Margaret Cavendish, and beloved Little Women author, Louisa May Alcott (!!). Claire’s production segment picks up from there, describing the life and career of C.L. 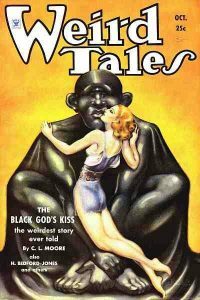 Moore before getting into the origin and growth of pulp fiction, and Weird Tales, the magazine that launched Moore’s career. Our hosts conclude with a discussion of why they paired Jirel of Joiry with Outlander, their reaction to Jirel, and the audience for her 85 year old pulp stories today.